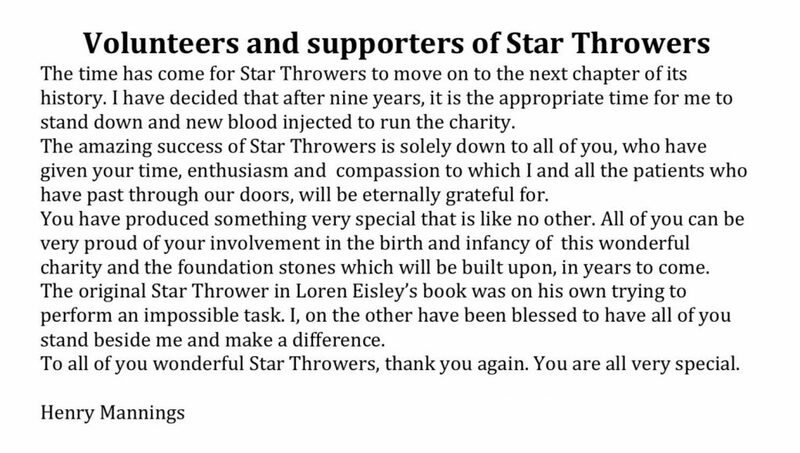 After 9 years of dedicated service to Star Throwers, Dr Henry Mannings has announced his retirement from the charity which he founded. On behalf of Star Throwers, we would like to thank Dr Mannings for everything he has given to the charity and the cancer patients and carers he has supported over the last 9 years. We know that he can look back and be proud that he founded this charity that has helped and will continue to help many people affected by cancer. Moving forward, Star Throwers will continue to provide information and guidance to help people better understand their cancer and empower them to be able to make informed decisions about their treatment options. We will also continue to support the holistic needs of people with cancer and their loved ones throughout their cancer journey – through our lymphoedema service, complementary therapies, gentle exercise groups, writing group, patchwork club, counselling service, and nutrition workshops and talks. The charity also has some exciting projects to look forward to in the near future including a new website and a DIY-SOS style refurbishment to the current cancer centre. Our vision remains to deliver, expand and develop the vital support that we provide for people with cancer and their loved ones. We would like to take this opportunity to say the very biggest thank you to all of our staff, volunteers, and supporters for their continued support – the charity simply could not exist without them. We look forward to continuing to work together to develop Dr Mannings’ vision and legacy, and most importantly, supporting both those living with cancer and their loved ones. Finally, we reiterate our thanks to Dr Mannings and would like to take this opportunity to wish him a long and happy retirement.